We are easy to find. Heart of Downtown Rockford. 111 Courtland, just east of Main. Entertaining a large group? 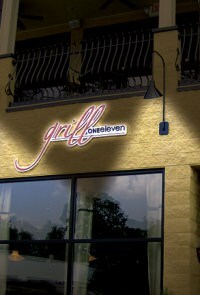 Grill One Eleven is the perfect place. We have large tables upstairs in a cozy private atmosphere, just right for your special get-together for business or a family event. Check out our "Large Parties" menu and see how easy and delicious it is to host your group gathering at Grill One Eleven. Grill One Eleven "Large Parties"